We didn’t get on a plane this year – we aren’t driving anywhere for the holidays. In fact, this is the first year we haven’t traveled somewhere for the holidays … well, I guess, ever! 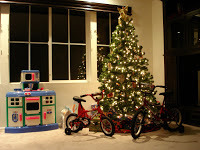 This is the real classic Christmas for us – from the red brick fireplace with 4 stockings, a Christmas tree with piles of inexpensive yet thoughtful gifts underneath, bikes for the boys and a play kitchen for the girl. Christmas Eve … actually Christmas Day, now … 12:45 AM and Santa’s getting tired. Merry Christmas from the Griffins!